Did you know that re-using plastic drink bottles may be harmful to your body as well as the environment? They're pretty - Beautifully designed with your choice of five gorgeous colours. Easy to use - Simply flip open the cap and drink from a thread free spout. Add some ice cubes or lemon slices into the handy wide opening. 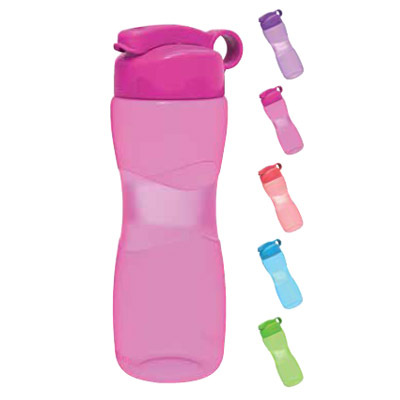 The Kor bottle features a convenient handle and non-slip rubber bottom. BPA is an abbreviation for Bisphenol-A. BPA is an ingredient used in the chemical compound that lines the inside of food containers. It also is the major building block in Polycarbonate plastic, which many drinking bottles are made from. The bonds in BPA are prone to falling apart and leaching into your water. This takes place over time and can be accelerated with heat. BPA is a chemical that messes around with your hormones by mimicking estrogen activity. Having too much BPA in your body can cause negative health effects including obesity, breast and prostate cancer, fertility problems, heart disease, diabetes and altered brain and behaviour development. Tritan is a co-polyester. Not only is Tritan™ manufactured without bisphenol-A (BPA), it also has heat-resistance qualities that ensure sports bottles and kitchenware can be manufactured in radiant colors, and safe in the knowledge that repeated trips through the dishwasher won't dim their luster. Make the change today. View our range by clicking here.